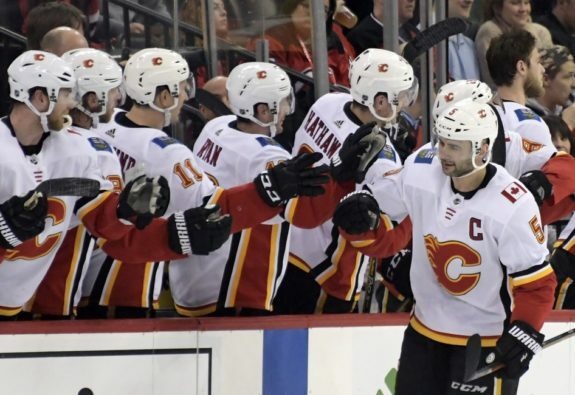 The Calgary Flames finished the 2018-19 regular season second in the National Hockey League’s overall standings. Considering that they missed the playoffs by 11 points the season prior, it was a remarkable turnaround. While the club made a bunch of personnel changes – large and small – that fueled their breakout campaign, five changes in particular paid big dividends. Following an inconsistent 2017-18 season, Flames general manager Brad Treliving relieved head coach Glen Gulutzan and assistants Paul Jerrard and Dave Cameron of their duties. In their place he hired former Carolina Hurricanes coach Bill Peters, Boston Bruins assistant coach Geoff Ward, and Stockton Heat head coach Ryan Huska. The change-up worked wonders, for the most part, in this past season. Peters is much more likely to make in-game lineup changes and shorten his bench to give his key players more ice time than Gulutzan was. Ward revamped the team’s power play, making structural changes that made the units more dangerous – though the PP still struggled down the stretch with consistency. Huska made adjustments to the penalty killing deployments to make the team more aggressive and led to the club scoring a league-leading 18 shorthanded goals. His familiarity with the team’s younger players from his days as the farm team’s head coach definitely helped the Flames utilize them more effectively. The Flames acquired Elias Lindholm in a swap with the Carolina Hurricanes at the 2018 NHL Draft. With Sean Monahan coming off several off-season surgeries, the decision was made to use Lindholm on a line with Monahan and Johnny Gaudreau during pre-season so Monahan could take fewer face-offs and take less wear and tear. When the Flames tried out the trio during their trip to China, things just clicked right away. Lindholm’s two-way presence helped the trio be more defensively responsible than they were a year prior while not really diminishing their offensive potency. Heck, having two skilled players there to feed him the puck helped unlock Lindholm’s scoring as well. All three players hit career highs in their offense statistics, while their responsible play allowed Peters to use them in a wider variety of situations than Gulutzan was able to the season prior. Chemistry is a weird thing. Teams can put together 20 of the most skilled players imaginable, but if the chemistry isn’t there then the team just won’t have success. TJ Brodie is arguably a talent downgrade from Dougie Hamilton, but Brodie and Mark Giordano just click together like few pairings in recent Flames history. A reliable, puck-moving duo for several seasons, they were split up a couple seasons ago so Giordano could play with Hamilton. It was a lateral move for a top pair, and made the rest of the pairs weaker. But after some off-season tinkering, Giordano and Brodie were reunited and found their old chemistry. Tasked with facing the top lines on every team they played, they ended up on the ice for 12 more goals than they allowed. 2015 second round pick Rasmus Andersson was the last defenseman cut by the Flames in training camp. When Travis Hamonic fractured his jaw in the season-opener, Andersson was summoned from the AHL for spot duty. Making the most of his window to impress, he ended up playing extremely well and stayed for the rest of the season with the club making some other moves to keep a spot open for him – including frequently scratching veterans Michael Stone and Dalton Prout. Also, Saturday's Battle of Alberta might be meaningless in the standings, but Rasmus Andersson's dad flew in from Sweden to see him play in the NHL for the first time, so yeah, it feels pretty huge to them. Equal parts skilled, mobile and hard to play against, Andersson emerged as one of the most reliable rookie defenders in the NHL. Blessed with a hard, accurate shot, he was frequently the player put on the ice as the extra attacker when the team needed a tying goal and he became a key part of the second power play unit. Heck, he even played on the top pairing with Giordano from time to time. Not bad for someone who was sent to the minors to begin the season. Treliving often jokes that the game of hockey should just be called “goaltending” given that position’s importance to winning and losing. Rather than rely on a designated starter as they did in 2017-18, the Flames seemed content to rotate between veteran Mike Smith and NHL sophomore David Rittich throughout the season. The rotation allowed the team to avoid the ups and downs of having a designated starter. It also gave them a chance to reduce the wear and tear on the Smith (who turned 37 in March) and keep developing Rittich’s game and confidence, playing just his fourth season in North America and still very much a blank slate.